Pedals are a crucial part of any bike. They are one of the three contact points where your body and your bike meet. Flat pedals for mountain bike are also the means by which you transmit the power in your legs into the bike’s drivetrain to propel you along the trail. For the vast majority of cyclists, clips rule the roost. 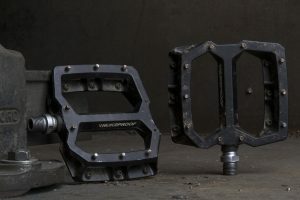 For them, flat pedals for mountain bike are no more than an old-school throwback to the dark days of mountain biking. Although they are the older type, we believe that people should learn to ride with flat pedals. Why? Because they are an absolutely fantastic way to get better at riding. You don’t need to use them all season to see the benefits. A few weeks riding flat pedals can greatly improve your technical abilities and riding economy on the trails. 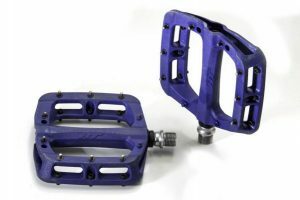 If you are looking for something functional on a budget, these flat pedals for mountain bike are well worth a look. All pedals on the list are priced at $100 or less. The Nano-x EVO is the evolution of the award-winning Nano-x. The Nano-x Evo is larger than the original, but still keeps the same, shallow 17mm profile. The massive platform holds your foot in a way that is both supportive and comfortable. The wide, concave body provides a stable platform. There is more than enough room even for the bulkiest of shoes. With lower price comes a few compromises, though. Weight is one of them. The Nano-x EVO is on the heavier side, but the weight difference isn’t really noticeable. For $40, we can honestly say that the Nano-x is an incredible flat pedal. It is well-balanced, offers sufficient grip, and affordable. Over the last few years, flat pedals for mountain bike have seen a bit of a design renaissance, including a trend towards larger platforms. Pedaling Innovations took the idea of big to a whole new level. Measuring 95x143mm, these pedals are massive. In fact, they are biggest and most radical looking platform on offer. Pedaling Innovations promises a more comfortable ride and better performance with these large platform pedals. The elongated platform is intended to increase power and efficiency by supporting the foot at both ends of the arch, making it less prone to collapsing and leaking energy. 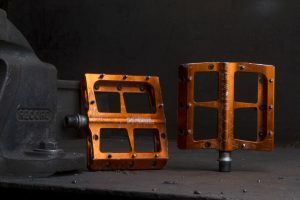 Nukeproof Horizon Pro Flat Pedals have all the features found on the Horizon Sam Hill, which was designed in conjunction with 5-time downhill world champion Sam Hill. 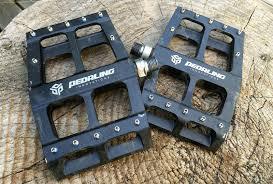 The pedals have a decently wide platform, offer a ridiculous amounts of traction, and reasonably competitive weight. 100 mm platform is wide enough to accommodate clumpy Five Ten soles without poking out from under them. With a concave shape and 10 pins per side, the Horizon Pro are a top performer. Overall, they are a great option for mountain bikers who are looking for a good entry-level flat pedal. HT PA03A may not have the snappiest of names, but don’t let the boring name and budget price put you off. The affordable price is due to the fact that the body isn’t made of aluminum. Rather, it is made from nylon reinforced plastic. Unlike other plastic pedals, HT PA03A is lightweight and highly durable. It has a good grip and support that is close to the very best alloy pedals. It has a slightly concave shape to allow your foot to sit in. HT PA030 is easily one of the best plastic flat pedals for mountain bike on the market. At this price, these lightweight, grippy flat pedals are an absolute steal. Chromag has a reputation for making high-end, extremely durable components, and the Contact is one of them. 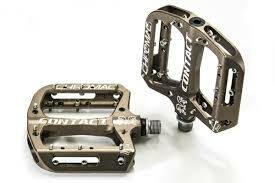 Chromag’s Contact Pedal is comfortable, grippy, and light. The pedals feature a lightweight, compact platform body that extends inboard. Grip is excellent with pins fully extended. Traction levels are superb. Pedal underfoot is superb on the Contact. The platform is very thin, measuring just 13 mm tall, but the slimness means you really stay planted and stable. It still packs enough concavity to cradle the foot securely.